Harmony is an entertaining and thought provoking new musical with music written by Barry Manilow and book and lyrics written by Bruce Sussman at the Ahmanson Theatre in downtown Los Angeles now through April 13, 2014. 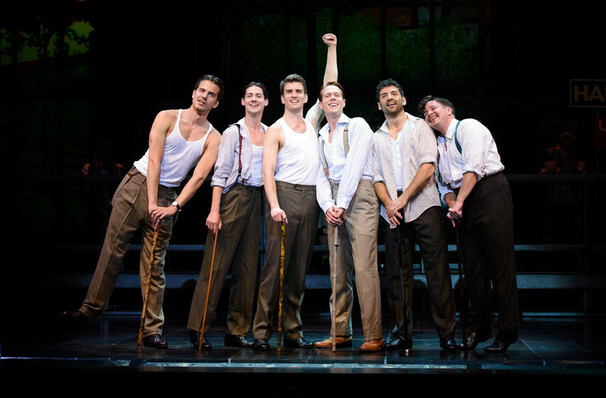 Harmony is based on a true story about six talented young men who came together in 1920’s Germany and took the world by storm with their signature blend of sophisticated close harmonies and uproarious stage antics. The Comedian Harmonists sold millions of records, starred in a dozen films and packed the houses of the most prestigious concert halls around the globe until the world they knew forever changed. The story centers around the indelible six-part harmony, their taleneted voices and comedic gifts, friendship, love, politics, war, and sticking up for what you believe in against all odds. I found this musical entertaining and enjoyed how it was able to transport me back in time to Europe and Germany in the heyday of 1920’s and then how it sadly changed during the Holocaust. The ensemble of actors playing the Comedian Harmonists were very talented and I thoroughly enjoyed their musical talents and comedic timing. I also enjoyed Barry Manilow’s music and how it accurately reflected that time period. However, what I found the most appealing about this show was the incredibly intriguing story, especially the second half which centered around the persecution of the Jew’s and how the mixed religion group dealt with these challenges. It was especially interesting to learn that the Harmonist’s celebrity helped them get around being discriminated against at first, and then eventually these differences tore the group apart. I really got immersed in this story and went along on the journey of emotions, the highs and lows and the challenges of this tumultuous time. BUY NOW AND SAVE UP TO 35%! *Tickets only $39 for mid-orchestra seating (Rows R-W, regularly $60) on weeknight performances (Tues-Fri) thu March 25th. I saw “Harmony” on March 9th. And, it was Wonderful…Barry & Bruce, your Dreams are coming true. We are all so proud of you. I Love You, Barry….